Arianespace kicked off its fast-paced 2016 operational schedule tonight with the 70th consecutive launch success using Ariane 5, which orbited a pioneering new-generation satellite for this workhorse vehicle’s leading commercial customer. Lifting off exactly on time from the Spaceport’s ELA-3 launch zone in French Guiana, Ariane 5 released Intelsat 29e – international operator Intelsat’s milestone first high-throughput EpicNG-series spacecraft – into geostationary transfer orbit after a flight sequence that lasted approximately 30 minutes. The mission was designated Flight VA228 in Arianespace’s numbering system. Intelsat 29e, which had a liftoff mass estimated at 6,552 kg., is the 56th Intelsat satellite to be launched by Arianespace to date – extending a long relationship between the two companies that was further underscored by Arianespace Chairman & CEO Stéphane Israël during his comments from the Spaceport. 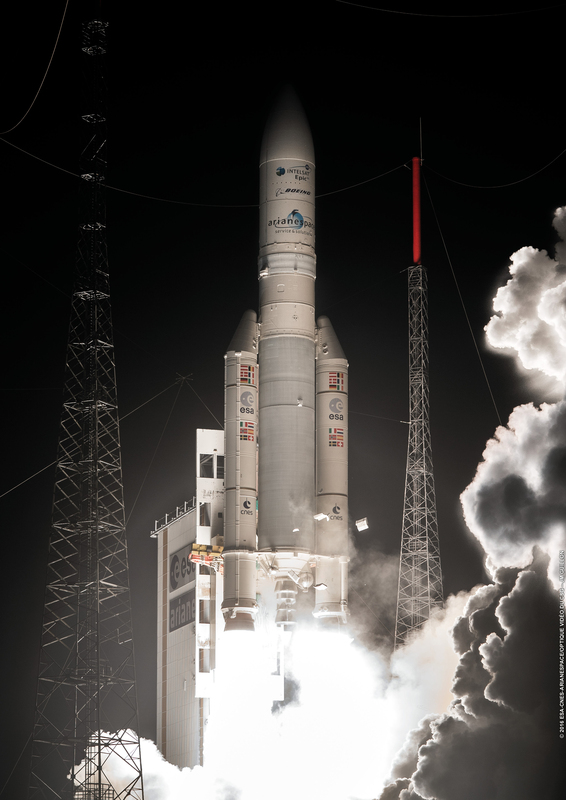 Flight VA228 was the 84th launch for Arianespace’s Ariane 5, which operates from French Guiana. Intelsat 29e has one of the most advanced digital payloads commercially available – operating in the C, Ku and Ka frequency bands. The spacecraft will offer enterprise-grade broadband services to fixed and mobile network operators, aero and maritime mobility service providers, along with government customers; and its coverage area is the Americas and over the North Atlantic (for sea and aviation routes). Payload prime contractor Boeing also was acknowledged following Intelsat 29e’s successful launch, as it marked the first time in more than eight years that one of the company-built satellites was orbited on an Arianespace mission. With tonight’s flight, the company has launched 51 Boeing-built spacecraft in total. 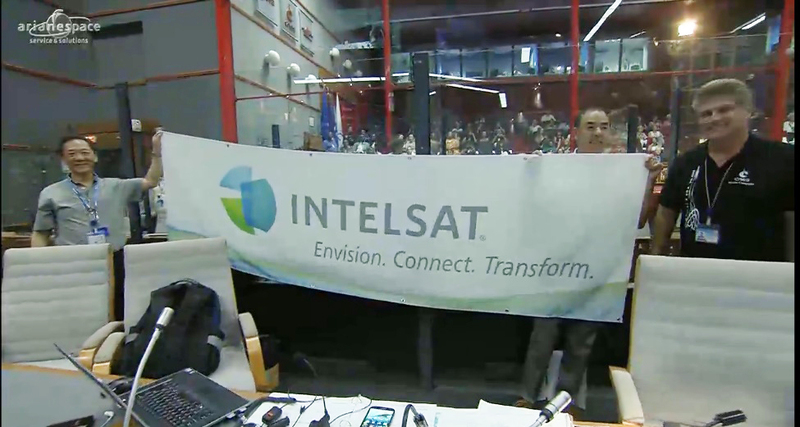 During the live broadcast of Flight VA228, Intelsat team members celebrate Arianespace’s successful launch of Intelsat 29e in the Jupiter control room. These four spacecraft consist of the two additional Intelsat satellites for launch in 2016 and 2017; along with SES-15 – which will be orbited for operator SES, and one for an undisclosed customer. Tonight’s mission was unique for more than its pioneering EpicNG payload. First, Intelsat 29e has the distinction of being a single telecommunications satellite on a dedicated Ariane 5 flight – which is in contrast to the typical two-passenger configuration for this launcher on missions to geostationary transfer orbit. Flight VA228 also was the first Arianespace mission since 2002 to be performed in the month of January – giving the company an excellent start as it targets a record operational year for Ariane 5, with as many as eight launches to be performed in 2016 using the heavy-lift vehicle. Altogether, Arianespace has the objective of performing up to 11 missions in 2016 with its full launcher family of today – consisting of the heavy-lift Ariane 5, medium-lift Soyuz and lightweight Vega. Download a high-resolution version of this story’s liftoff image from the Gallery. 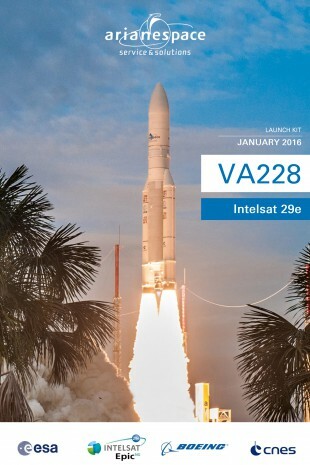 Learn more about Arianespace Flight VA228 by reviewing the launch kit.